Like riding in the city, but don't want to look like a goon? Hoodies are cool, but they don't really offer any protection. Take one part armored hoody and one part proper riding jacket, and you get REV'IT's new Flare Jacket. With a casual-looking exterior in 600D textile, you'll be protected without looking like a Power Ranger. While the REV'IT! 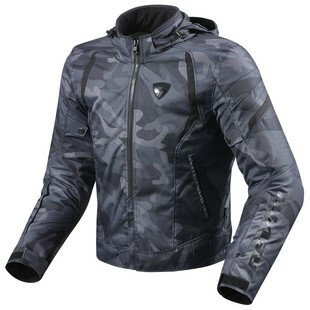 Flare Jacket looks like a hoody, it's a full-fledged motorcycle jacket. It comes with a Hydratex waterproof liner than cannot be removed, but a thermal liner that can. An abrasion resistant chassis comes in a blueish, grayish urban camo color scheme that will ensure no one sees you on the mean streets of wherever you happen to live. A full compliment of Knox CE-rated armor will keep nasty things at bay, though you'll want to purchase a Seesoft back protector if you're serious about not breaking bones. And to help with that, the Flare offers a tight, race fit. That means your armor won't be flopping around should you take a spill. If you want to look casual, but know that normal armored hoodies don't offer much protection, the REV'IT Flare just became your new best friend. Finally, a proper blend of street style and moto protection has arrived.